As the sale of the cupcake declines, we see a global rise of 23 per cent in the sale of the eclair….So is it possible for the eclair to take over and reinvent itself as the trendiest pastry around ? The chocolate eclair has been a traditional pastry since the 19th century, but now we are seeing the introduction of new flavored fillings and toppings, from jasmine to green tea and I am sure somewhere… some place, there already exists a red velvet eclair, and if not, without doubt we will see its appearance very soon. Eclairs are here to stay, they have been here forever and will certainly not go away but as to whether home bakers will spare the time and patience to devote the extra attention required to bake a perfect eclair, this I am not quite sure of yet…. And I am also not convinced that young mums will really want to see their toddlers getting hooked on all that cream…. Unless of course we can fill them with something that appears to be a little healthier like ricotta ? Over the next few weeks I am going to try out various combinations as I am curious and right now I am trying to work out in my head if it would be feasible to create a good tasting, full of flavor savory eclair? Who knows, we must experiment with some new recipes and find out ! Preheat oven to 220 C and place a large pan of water at the bottom of the oven so that there is moisture in the oven. Add sieved flour and mix well. I use a wooden spoon. Return to moderate heat and stir continuously until mixture leaves the sides of the pan. Beat the eggs in a separate container and gradually add to the pan. Do not add all the eggs at once and stop when the mixture is at dropping consistency. A good test for this is to check that the mixture flows back when it is stirred on one direction. Place in piping bag with a nozzle of your choice and pipe onto a baking sheet. Bake at 220 C for 25 minutes without opening door. Cut open and pipe a filling of your choice. A friend of mine who lives in New York treats herself to an eclair from Francois Payard at the end of each week and they look to die for and if you are in London you must visit Selfridges and try their eclairs as recommended by Michel Roux ….and more on home made Eclairs very soon …. ← Lunch to go: Tuna and sweet corn pasta salad…. I tried them and they’re delicious.thank you. Strong flour is bread flour. It is also labelled as ’00’ flour. It is higher in gluten and produces more elasticity in the finished product. Soft flour is ideal for cakes and strong flour is usually used when making breads. It is available at most food stores and very commonly used these days. Hi Rebecca. Strong flour is usually used to make bread. In the US it would be known as high gluten flour and in some other countries it is known as 00 flour. Let me know how your eclairs turn out ! These were the Best Eclairs I’ve ever made! I filled them with some cream and poured some chocolate on top… oh my!! This recipe is definitely a keeper! Thank you so Much. Thank you Daria, its a foolproof recipe and I thank you for your feedback… So appreciated ! You re welcome! This eclair recipe always makes perfect eclairs without fail ! let ,e know if you make them ! Thank you. I will dream of them and the photo. They look SO delicious. Always tuen out perfect with this recipe ! Thanks for the following ! Thank you ! If you follow the recipe exactly, you will have perfect eclairs all the time ! OMG, those eclairs look soooo good. Great photos. How does one eat them and not gain weight? It’s easier in Europe, I think. Walking and different products not like GMO wheat and corn in the US. I think the food is cleaner there and healthier. Enjoy one for me. Thank you Carol. We do put on weight but we have the opportunity to walk in the fresh air and sunshine which burns some of it off! Thank you also for the retweet. Have a lovely day ! 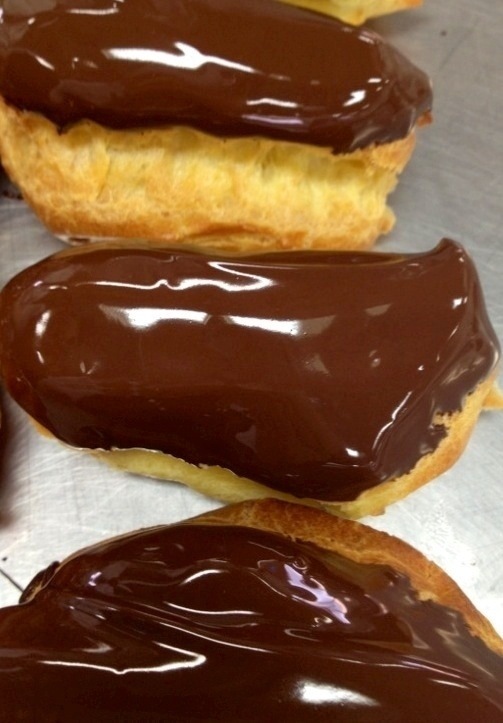 I have never made an eclair and would love to try these. Is a strong flour what we in the States know as “Bread Flour”? Also, I live at high-altitude; do you think the recipe would still work? Great recipe and photo, Lea. Shanna thank you, this is the most perfect recipe if you follow the instructions, guaranteed always great eclairs, tried and tested many times ! Yes strong flour is bread flour what in Europe they refer tomas 00 ! I adore Chocolate Eclairs, but way to lazy to make them. Thank you for the recipe, I will bribe one of my daughters to make some. if you follow this recipe exactly, follow the instructions, time guidelines and oven temperature, i guarantee that you will have perfect eclairs each time ! I would like to serve them for desert. Do you then eat it with a desert fork and knive? Yes of course you can, i would eat them with a dessert spoon and fork or make mini ones and you can just serve them using a fork. Let me know how they turn out… For me this is a perfect recipe ! how many eclairs doe’s this recipe make? Oops, sorry. Excuse the drool on the screen, it was the dark chocolate glistening at me. Those eclairs look stunning. I must try your recipe at home soon. Thank you for following my blog. I look forward to reading more of your blog. Emma. When I was 17 I would stop by our local bakery and buy an eclair every morning on my way to work. I’ll never forget the uniqueness of the pastry texture and the filling. 50 years later and 3000 miles across the country, I have yet to discover any eclair which matches that. Too much evolution, I guess. Peace. Yes they are a perfect pastry when made properly, bit this recipe im an old one passed on to my friend Renato by his father who owned a confectionary shop in the Capital City in 1956 ! So perhaps you have rediscovered an old time favorite ! I would love to make this recipe but I have no idea how these measurements translate in US measurement. can i have the US measurements for this recipe? Would you be able to give me the U.S. measurements for the ml and gms of water, butter and flour used in this recipe. After reading so many rave reviews, I’d to try making these. Thank you. Oops…I just noticed the post above mine with same question and the link you provided to convert the measurements. Thanks. Looking forward to making these delicious looking eclairs!